Awesome shot! Composition, DOF, shutter speed and color are spot on! Extraordinary work! Congratulations on your award. Beautiful movement in the water. Just a wonderful image. Well seen and handled. Stunning image. Great composition, colours and texture. Doesn't get to much better than this.. Outstanding !! This is a fantastic long exposure! Great composition and tones! 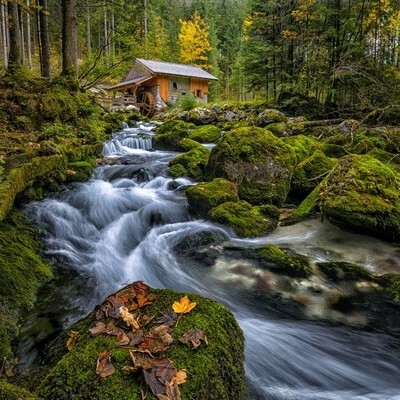 awesome shot............I voted for it in gorgeous rivers contest. I could sooo live in this place! A beautifully and skillfully crafted image ... Congrats on all your awards, well done. Beautiful and enjoy the motion of the water. Congratulations on your finalist. Image is crisp. Absolutely inspiring! Impressive image! My eyes were drawn to the light and Detail in the foreground and naturally traveled up to the mill. Congratulations on creating an image that is truly print Worthy. This is such a great shot! Color and the speed of the water really draws you into the image. Almost doesn't look real. Gollinger Mill just south Salzburg, near the Gollinger Waterfall. This Old Mill is close to the well known Gollinger Waterfall, which is about 30 km South of the City of Salzburg. This was taken late afternoon on an overcast day. For this kind of shot I prefer a cloud covered sky, so I don't have to much dark-light contrast. This shot was taken with a Nikon 610, a 16-35 Nikkor f4, polarizer filter on a tripod. The light was perfect and the leafs started to turn in colors. I postprossessed in Lightroom and finished in Color Efex Pro and applied a tonal contrast filter for more Detail in the water. Always use a tripod, a polarize Filter, look for an overcast sky and let the water run thru the shot and preferably out the bottom right corner.